'Osmosis' and blistering of yacht hulls - Yachtsnet Ltd.
As yacht brokers, ".... has this boat got osmosis...?" is one of the most frequent questions we are asked. We try very hard to answer honestly, as no-one is done any favours by concealing facts that will come to light on survey. It is however a complex issue, and it is not uncommon for two surveyors to have differing opinions on the condition of a yacht hull. A typical hull that has "...got osmosis". A number of larger blisters are visible, eg as marked with an arrow. Many more smaller ones will be almost invisible under the old antifouling, and some patches that look like blisters will in fact only be bubbles in the antifouling. This was an almost thirty year old boat, recently returned from 10 years afloat in the Med. This page attempts to be a simple summary of the issue generally called ‘osmosis’. Although usually referred to as ‘osmosis’ by boat users, osmosis is in fact one cause of water absorption into GRP hulls, and not a condition in itself. Nevertheless, we will use the common (although often incorrect) term 'osmosis' here. To start with the basics, a fibreglass or GRP (glass reinforced plastic) moulding is made up of thin glass filaments or strands, either woven into cloth, or in randomly assembled mats, bound together with a plastic resin. On their own the glass strands are strong but not stiff, and the resin is stiff but not strong. When joined together as the resin sets chemically, the result is both strong and stiff, and very durable. Ideally the final moulding should have lots of glass and only enough resin to hold it together and seal in the glass strands, but most conventional mouldings have much more resin than this ideal. Various types of resins, and various types of cloths and mats are used. A typical moulded GRP yacht hull will have as its outer layer a thin coating of a special resin called gelcoat, which forms the hard glossy outer surface of the hull. Inside this will be several layers of glass mat, often reinforced with one or more layers of ‘woven rovings’ - glass strands woven into a thick cloth, all bound together into a single structure by the resin. Most yacht builders * have usually moulded the hulls layer by layer, letting one layer of glass and resin set before putting on the next. Provided the hull is moulded properly, without long delays between layers, all parts of the moulding bond chemically into a single body - unlike, for example plywood, where a number of distinct layers are glued together. The resins used vary. The earliest resins used, back in the 1960s, were orthopthalic polyester resins. By around 1980, isopthalic polyester resins started to be used as well by some builders, as they were more water resistant, although more expensive. Most builders used these more expensive isopthalic resins only for the first outer coats, and then saved money by using the cheaper orthopthalic resins for the inner layers. A few used isopthalic all the way through. Some builders have also used double layers of gelcoat, in an attempt to stop osmosis occurring. It did not generally help to stop osmosis occurring. The latest type of resin is called vinylester, and is said to be even more waterproof than isopthalic polyester. It is of course even more expensive, and the same option of using only as an outer layer is open to builders if they are trying to cut costs, as all yacht builders almost invariably are. The cost difference between 'vinyl', 'iso' and 'ortho' resins is such that many yacht builders still only use isopthalic or vinylester resins for the outer layers, completing the inner bulk of the fibreglass layup with cheaper orthopthalic resins, and non powder bound mat. Note the exact wording of the hull specification at right, taken word for word from the brochure for a very expensive yacht. There are however some builders who are using isopthalic or vinylester resins throughout - those who do generally tell you! While new yacht brochures will go to some lengths to tell you about the exotic woods used in the interior, the Corian worktops or the leather covered wheel, very few will actually give a layup specification for the hull. Most do however mention the gelcoat used, some builders claiming that 'their' special gelcoat will prevent osmosis. Unfortunately they only guarantee this for five years. Despite most people’s assumptions to the contrary, fibreglass mouldings, no matter what resins are used, are not actually totally waterproof. Individual water molecules are so small that they can actually find their way into and ultimately right through the layers of glass and resin forming a boat hull, or GRP pond liner. This in itself is not osmosis, it is simply a minute degree of permeability of the material. Diffusion of fluid through a semipermeable membrane from a solution with a low solute concentration to a solution with a higher solute concentration until there is an equal concentration of fluid on both sides of the membrane. The tendency of fluids to diffuse in such a manner. The important parts are that the hull is not waterproof (it is a semi-permeable material), and that osmosis causes a low concentration fluid (water) to pass through the hull to join the higher concentration fluid (the chemical mix formed by the water plus WSM) inside the laminate). Pressure is thus built up inside the laminate. If this process takes place in a solid part of the laminate, there is usually no problem as the structure is strong enough to contain the pressure. If however it takes place on the boundary of a small air-bubble in the moulding, or at a point where layers of GRP are poorly bonded, the resultant new chemical compound or compounds slowly fill up the bubbles or the minute gaps between layers with liquid. Almost all mouldings have these air bubbles and small areas of poor bonding, although they should not. Ideally the resin should totally fill the gaps between the glass strands, and every layer should perfectly bond to the next. In practice, however, this is extremely difficult to achieve with conventional moulding techniques. The process of osmosis in GRP is however very slow, unless the moulding is appallingly badly made, and no matter how long it remains in water a typical GRP laminate cannot absorb more than about 2-3% of it’s own weight of water. Surveyors and boatyards (and some brokers, including Yachtsnet) put moisture meters on yachts hulls to check the moisture content, on the basis, often but not always correct, that high moisture levels in the GRP are a precursor to the development of blisters. If this osmosis (using the term in it’s correct manner for once) was all that happened, it would be a very minor problem. Even completely saturated with water molecules, a GRP laminate still retains most of it’s strength, although it does become slightly more flexible and weighs a tiny bit more. Racers who want stiff hulls with the absolute minimum weight already mostly keep their boats ashore when not sailing, and for any properly built cruising boat 2% or so extra weight and a trace more flexibility in the structure should not be a problem. Once again, if the air bubble simply filled with this acidic compound, the problem would still be relatively minor. However the nature of the osmosis process is that water molecules keep osmosing through the laminate, and join the chemicals in the bubble, steadily building up hydraulic pressure. Eventually this causes the surface of the moulding to blister. These blisters are the typical sign of what boat-owners usually refer to as ‘osmosis’. When pierced these blisters will give off a small amount of chemical-smelling (usually vinegary) liquid - which is the juice built up inside the pressure-raised blisters. The term ‘blister juice’ is often used. This ‘blister juice’, which is usually acid, can break down the polyester. This breakdown process is known as hydrolysis, and causes a reduction in strength of the laminate. This is however normally very localised, and the moulding as a whole will still retain most of it’s strength despite blistering. Most blisters are in the interface between the gelcoat and the structural laminate, and have very little effect on the hull's overall strength. Only if the blisters are very large, or very deep-seated, are blisters generally a structural problem. It is rare, but not that rare, to find osmotic blisters above the waterline. They can however occur anywhere on a GRP moulding. More often they are found underwater, often partially obscured by layers of antifouling paint, though they are also very common inside glassfibre fresh water tanks. When looking for blisters on a hull, shining a light along the hull surface can help, as can wetting areas of the antifouled hull surface to make it shinier. The yacht in the photos above had been given a below-waterline 'osmosis treatment' at some previous date, and the bottom was now in good condition, with low moisture levels by a moisture meter. The topsides however gave very high readings, and had a fair number of blisters. One scientific study of the problem of blistering was given in the paper "Causes of Boat hull blistering". This 1987 study was carried out by Thomas Rockett, Ph.D. and Vincent Rose, Ph.D., at the University of Rhode Island, and was partly funded by the US Coastguard Service. Yacht hulls are typically built with a substantial safety margin of thickness and strength, and it is incredibly rare to find a yacht hull that is seriously weakened even by very advanced osmotic blistering. Often, the older the boat the heavier the original construction, and the greater margin of safety. Most blistering occurs near the outer surface of the moulding, usually in the borderline between gelcoat and underlying layers of resin and glass - and the gelcoat is largely cosmetic and not structural. Once blisters in the gelcoat have appeared, a period of storage ashore, particularly in warm dry weather, may cause many shallower blisters to apparently disappear, as most of the water in the blisters dries out. What is left behind, though, is a highly concentrated solution or even crystals of the 'blister juice', which will usually rapidly re-absorb water once the hull is put back into the water. Normal winter periods ashore definitely slow down the process of yacht hulls developing osmosis, as they do partially dry out each winter, even in northern European weather. However you cannot simply dry out a wet hull by leaving the boat ashore for a few months - water that took fifteen or twenty years to get into a laminate does not escape in months, unless the gelcoat is removed as is done in "osmosis treatments"
As brokers, we have many times seen situations where an older boat that has previously always been wintered ashore every year, is for once left afloat for an 18 or 20 month period, and is found to have developed blisters when lifted for survey. The process of osmosis is fairly well advanced by the time visible blisters start to appear on the bottom of a hull. It must be realised however, that the process starts the minute a new yacht is craned into the water, or even when it’s hull and deck first gets rained on as it is wheeled out of the factory. Another facet of water absorption into a hull is known as ‘wicking’. This refers to the ability of water molecules to creep along the boundary of the individual strands of glass within the moulding. A totally dry moulding, if moulded with unpigmented resin, will be virtually transparent. If you can see individual strands of glass as whitish threads, what you are seeing is not the glass strands themselves, but microscopic traces of water around the strands. This ‘wicking’ is an indication that there is a significant amount of moisture in the resin, and is often a precursor to or accompanies blistering. 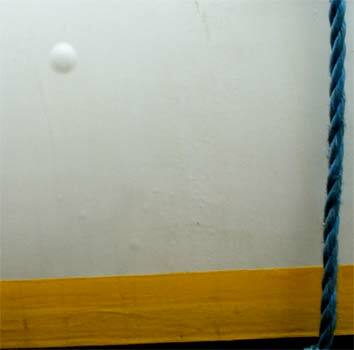 Unless very severe, wicking is much more difficult to detect if the layup moulding resin is white or coloured rather than clear. It is generally accepted that clear resin is less likely to suffer from osmosis or wicking than pigmented resins, and many quality builders use clear resins for at least the underwater areas of their hulls. We thus have a "Catch 22" situation that the better quality mouldings, with clear resins used, are more likely to be found to have wicking - 'found' being the significant word! Just as the tests for astronauts in the space programme proved that anyone would get motion sickness if shaken around enough, all GRP yachts, from the day they are built, suffer from osmosis. Manufacturers now typically offer five year hull warranties, and it has been said - cynically but probably accurately - that their main concern is not to build yachts that do not suffer osmosis, but to do just enough that they don’t get visible blisters within the warranty period, which for most yachts is 5 years. Several US manufacturers of small power boats, however, now state in their warranty conditions that the boats are not to be left afloat for more than 2 weeks, or the warranty against blisters is invalid! At least one US builder will not offer any warranty at all against blisters. 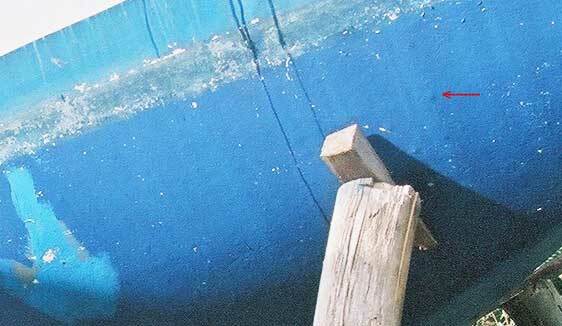 Historically, there have been some batches of boats that have suffered severely from blistering. Often this was due to changes in layup specification, and use of new materials. For example, it is now known that the use of PVA emulsion bound glass mats is bad practice. Emulsion bound mats were introduced in the 1960s as an improvement, and accepted by Lloyds and other classification societies for standards of hull construction for almost 20 years. Emulsion bound mats are now regarded as bad, as the PVA is water soluble, and tends to encourage wicking. Mats used now should be powder bound, especially in the outer layers of a laminate. Nevertheless, plenty of yacht builders still use emulsion bound glass mat in inner layers of hull layups. Whilst some builders, including those who produce some very expensive boats, have had runs of boats prone to blistering, they have also turned out apparently identical boats that have not blistered. Current thinking is that cleanliness, temperature and humidity control in the moulding shop, and precision of the mix of resins, are the key to building boats that will not blister. Nevertheless I know of one builder who worked in a dirty corrugated iron shed where the climate control was dependent on whether an easterly wind blows through the gaps in the door. His boats actually had a rather good reputation for ‘not getting osmosis’. Whilst all GRP boats slowly absorb some water, it should not be fast. Visible blisters or wicking are an indication of a well developed absorption of water, and if they occur in the first few years of a boats life are an indication of a moulding problem of some sort, whether it be poor materials, poor workmanship by the laminators, or any other quality control problem ranging from sawdust getting into the moulding to a prolonged delay (factory holiday - several people off with flu?) between laminating up the various layers that form the hull. If the builder is still trading they will normally repair this under warranty. Unfortunately whilst the original bare hull moulding of a £100,000 yacht might only cost £12,000 to mould, it will cost another £50,000 plus to fit it out even if using every removable part from the faulty hull. So the builders will ‘treat’ the ‘osmosis’ by the standard current method, namely stripping off the external gelcoat, drying out, and recoating with epoxy fillers. As this new external coating is essentially ‘glued on’, and not chemically part of the original moulding as was the original gelcoat, it can be argued that the boat is substantially devalued by this repair. By ten to fifteen years age it is common to find that yachts hulls have a moderate to high moisture content. Some may also have developed a few blisters. This is absolutely typical, and not necessarily a sign that there is anything terribly wrong with the boat. If a yacht reaches twenty or thirty years of age without high moisture content or visible blisters it is actually a bit of a surprise. These timescales assume a standard mass production yacht, given average use of perhaps seven or eight months afloat a year, with just antifouling paint on the bottom. Painting the hull bottom with epoxy coatings can considerably, but not totally, slow down the rate of water absorption, and some builders do this from new (including the local tin-shed boatbuilder referred to earlier). Opinions vary as to the effectiveness of epoxying or painting once there is already some moisture in the moulding. 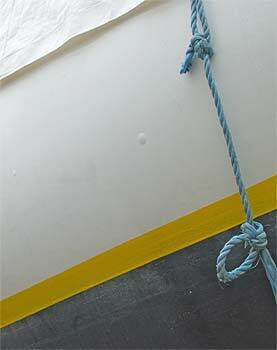 On boats which have been painted or epoxied, it is not uncommon to find, after a few years, blisters in the interface between the epoxy/paint coating and the gelcoat. This is obviously less of a problem than blisters under the gelcoat itself. Some experts believe that paint or epoxy coatings are not a 'once-and-for-all' protection, but should be renewed regularly to maintain effectiveness. Go to your local ‘Osmosis Treatment Centre’ and pay rather a lot to have the gelcoat removed, the hull washed and dried out, and the hull recoated with epoxy. The smaller and older the boat the less cost-effective this is. 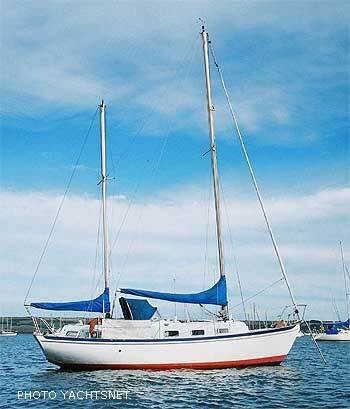 Treating an old 25 foot boat could cost almost £5,000 on a boat perhaps only worth under £10,000. On a 50-footer worth £150,000 the cost might be £15,000 - a far lower proportion of the boat’s value. Yards used to offer a five year warranty with this work - many no longer do so, or charge extra if you want the warranty (they buy insurance against claims). * One factor that is becoming increasingly apparent is that early osmosis treatment on the basis of high moisture readings alone, or a few small blisters, is not actually a good idea - it seems to be better to allow the blistering to develop fully before carrying out an "osmosis treatment". If you are keeping the boat yourself you can look at these options and decide which way to go depending on inclination, temperament and bank balance. If you are trying to sell the boat, other factors come into play. Buyers almost always prefer boats without blisters, and even if there are no actual blisters, once a surveyor puts a moisture meter on the hull and says there is moisture in there, most buyers think “.... if I buy this it’ll get blisters soon and then I’ll have to spend thousands on an osmosis treatment” - so a ‘wet’ hull, even if unblistered, is much more difficult to sell. Unfortunately it is a common perception that any boat with a high moisture content or blisters, MUST be treated, and that the only treatment is the full Monty - strip off all the gelcoat and recoat. Boatyards like doing the work: it is profitable, and can be time-scheduled in to when staff have some free time. Some surveyors like to recommend it as it means they’ve ‘covered their backs’ against a later claim that they didn’t pick up a defect. It is certainly easier to sell an boat with no blisters and a low moisture content - so particularly on larger boats (a £10,000 hit on a £100,000 sale is not too disastrous) getting an ‘osmosis treatment’ done is often the way to go. You do however have to allow time for the work to be done - ranging from about 4 weeks if forced drying or a process called ‘hot-vac’ is used, to three to six months or even longer if the hull is left to dry out naturally in the open air, although shielded from rain. If you go for the option of treating blisters locally, the hull will still be wet, although with no blisters. A surveyor will probably report this, and a phrase along the lines of “.... it may be necessary to carry out an osmosis treatment in a year or two” is very common in survey reports. Certainly it may be. Or it may not. Either way the surveyor can’t be sued for negligence for failing to point something out. If you are buying a boat, obviously it is preferable to have one with no blisters and a dry hull (low moisture levels on the magic meter). If this condition is achieved by the original hull surface, with no repairs, it is clearly better than a similar boat that is also dry and with no blisters, but achieved by having recently had an ‘osmosis treatment’. The treatments are not cures - they simply 'restart the clock' on a progressive slow period of absorption of water again, as even epoxy coatings are not totally waterproof. Nevertheless, do not reject an older boat just because it has had an osmosis treatment - as it may be quite impossible to find another of the same age and type with a dry original hull surface. If you are looking to buy a small - 20 to 30 foot or so - boat at relatively low cost you will inevitably be looking at boats of 20 or more years of age. It is almost inevitable that most of these will have either highish moisture levels in the hull, or have some blisters. Even if blisters are not obvious when you look at the boat yourself, once a surveyor has scraped off antifouling in patches it is likely that he will find tiny beginnings of blisters - "baby blisters" as one surveyor describes them. You can go through a lot of expensive surveys, rejecting boats, before you find the rare one that has a perfect hull. Occasionally buyers will happily accept a boat with high moisture content or obvious blisters - on the ground that they can haggle down the price as a result. They then may or may not then get some form of treatment done - perhaps just before they sell it on a few years later. If a seller is genuinely unaware of the moisture content/blisters, a situation which is not uncommon, as many blisters are small and can be invisible under antifouling, and this is discovered on survey, a common compromise is to knock about half the cost of an ‘osmosis treatment’ for that size of boat off the price. It is unfair to expect the owner to take the full price off, as if the gelcoat is replaced the boat is more saleable, and hence more valuable, as it then has a known low moisture content and no blisters. This "split the cost" compromise is often agreed for medium to large boats, but for small, low value boats the cost of having a full osmosis treatment done is so high in relation to the boat's value that it is rarely possible to reach this compromise between buyer and seller. The first thing to know about moisture meters is that they don’t actually measure moisture. They measure conductivity. My Tramex meter (a popular model with surveyors and boatyards) invariably shows a very high moisture reading on the solid and absolutely dry glass top of my living room coffee table. It’s measuring the presence of minute traces of carbon (an electrical conductor) in the lightly smoked glass. For this reason these meters are only of value when used comparatively. A reading of the underwater body alone is valueless - the glassfibre gelcoat may be made with pigment that is itself slightly conductive. For this reason it is usual for test readings also to be made on the topsides - if the hull topsides well above the waterline consistently read medium or high then there is certainly reason to doubt whether a high reading below the waterline really means moisture - although it could of course also be the case that there is water in the topsides laminate too - perhaps from leaks along the gunwale joint. 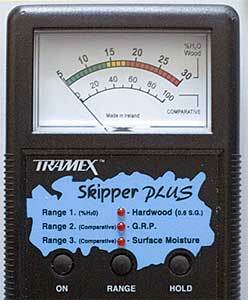 Tramex meters read quite deep into the moulding - deep enough to be fooled by materials inside the hull. I have been told by a surveyor that the bilge keels of a Seadog ketch had a surprisingly high moisture level compared to the rest of the hull. I told him (although I’m sure he would have worked it out for himself eventually) that these hollow bilge keels were the water tanks in this design, and currently near full. Bilge water in compartments inside the hull, metal reinforcements, wiring harnesses, even condensation inside inner hull linings, can affect the readings of meters. Sovereign meters, another common type, generally read to a much shallower depth. This can be either good or bad, depending on what you are trying to measure - surface moisture or deep seated moisture. The newest Tramex meters have an extra mode switch to reduce the depth of the reading. To make matters still more complex, the Sovereign and Tramex meters give results on different scales of sensitivity - Tramex from 0-30 and 0-100 and Sovereign from 0-25 and 0-100. So a reading of ‘20' could be quite good or quite bad, depending on which meter was used on which scale. Most yacht surveyors quote Tramex readings as 0-100 and Sovereign readings as 0-25. None of these moisture meters give an absolute reading of the amount of water in a structure: all they do is tell you that if readings in one area are higher than another, then that area might be wetter. It also might not. You could be reading the presence of something else that conducts electricity. It is common for surveyors to take moisture readings on hulls during a brief (often just 1 hour or so) lift-out. Particularly with older boats, built using orthopthalic resins, high readings will almost always be obtained immediately after hauling out, but these will often drop substantially if left ashore for a few days. This effect is less pronounced with isopthalic or vinylester resins - they are better at keeping out the water in the first place, but do not let it dry out again as easily. Whilst epoxy coatings offer some protection to hulls from water absorption, the epoxies themselves can absorb water, and be slow to dry out - up to two weeks is sometimes quoted. For most pre-purchase yacht surveys, having two weeks ashore before readings are taken may not be practical. The International Institute of Marine Surveyors Code of Practice for marine surveyors recommends that "... ideally the vessel should have been out of water for at least 24 hours". It also sets out a complex form of statistical calculation to reduce randomness of readings and take into account local temperature and humidity when measurements are taken. I have yet to see a yacht survey report that actually used this calculation. There is a common myth that drying out a boat with an osmosis treatment will make the boat much lighter, as tons of water will have soaked into the hull. In fact, no matter how "wet" the GRP is, it can only hold a maximum of around 2% to 3% water, and the GRP itself only forms maybe 20% at most of a typical sailing yacht's total displacement. So 2% of 20% of a 12,000 lb displacement 35-footer is 48 to 64 lbs of water that could be dried out by an osmosis treatment. This would alter the waterline by a tiny fraction of an inch. The stories you hear of boats floating several inches higher on their waterline after osmosis treatments are not due to removing weight - it just means that the new waterline boot-top is often painted several inches higher after the treatment, to disguse the imperfect joint line between original gelcoat topsides and epoxy treated bottom. The only time a boat can really put on major amounts of weight through water absorption is with foam-cored or balsa sandwich hulls, where the core material itself has become saturated, though this is more usually due to damage rather than normal use. Quite a few surveyors websites will tell you about osmosis - look at http://www.yachtsurvey.com/BuyingBlisterBoat.htm for a fairly laid-back American essay on the subject by a surveyor, much of which is to the effect that blisters are not usually that much of a problem, apart from being unsightly. This being America, of course, other articles on his website refer to new boat warranties that specifically recommend not keeping boats in the water for more than two weeks. This page is written by John Wilson of Yachtsnet Ltd., from the point of view of a very experienced small boat sailor, former owner of a yacht "with osmosis" (the boat was purchased knowing it had blisters), and yacht broker.